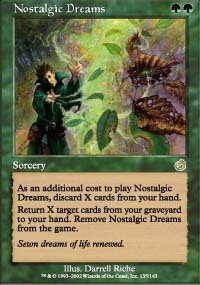 Nostalgic Dreams is an excellent, well balanced card, that's going to see itself found in a lot of broken, unbalanced decks. Green somehow became the "combo" color (along with blue) and I'm sure someone (like my brother) will find a way to torture the hell out of this card and make it unfair. In limited, this turns excess lands into cards you want to play again, and also helps you put cards into your graveyard that you would prefer to have there. Recall Rating: I'm sorry, I don't recall. Turpish Nostalgic Dreams hasn't impressed me much yet. I do, however, see potential. If it gets the right cards (or someone just notices them) that I don't currently see it having, it could become an essential part of a deck, playing a very limited role. I'm giving it a tentative 2, though ask me in a year or two and it might be a 3 or 4. This is an excellent card for most any green deck as it lets you recycle cards at a relatively low price. Suddenly extra lands can be Blastoderms or Herd tokens. The casting cost of GG is a fair price to pay to swap cards. Back in the day regrowth was a much played card and suddenly we get to meet his grandson. The card works well in limited for the same reason it works in constructed. It may even be stronger in limited as you will generally not have as many bombs and so using them twice could be devastating to your opponent. the cards you get back combined. be Ancestral Recall. 5 out of 5. I guess the key phrase to this card is that the cards you have to discard ARE NOT removed from the game. This means this whole genre of cards from Torment not only fuel Threshold effects... but they also have excellent synergy with both Madness and Flashback spells. Don't expect to break this card or even abuse this card if you're not planning on doing Madness tricks or something because there aren't any "broken" cards in this new environment that can truly be abused with good recursion/tudoring/ect. Recall is good. Threshold is good. Madness is good. I see a lot of good here. 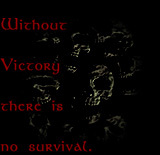 Getting it countered is a bad thing, but oh well - everything else is good. It will see constructed play, I am almost sure. will, remains to be seen. can't give you an accurate placing in a draft, but it will go fairly early. do know this, recursion is good, thus I think mass recursion is wonderful. don't have to worry about getting them back as much. getting cards back then Nostalgic Dreams.